Joel’s practice is focussed on body language and the interaction of people within urban environments. Paintings are made from sketches and photographs taken on location and created out of a desire to translate an atmosphere within the painted image. Paint is used as a way to get closer to an actual experience of a place, a vehicle for transferring emotions that a photograph might not give you. 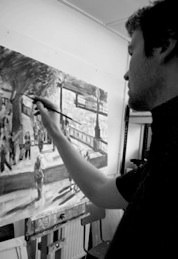 Joel Wareing is a practising artist and teacher based in Surrey. He is available for private tuition, workshops and demonstrations throughout the UK. If you or your art club are interested, please get in touch through the Education and Contact page.